Fill the cold steam pitcher a little more than 1/3 full with cold milk. ( Hint: non-fat, 1% and 2% foam the best. 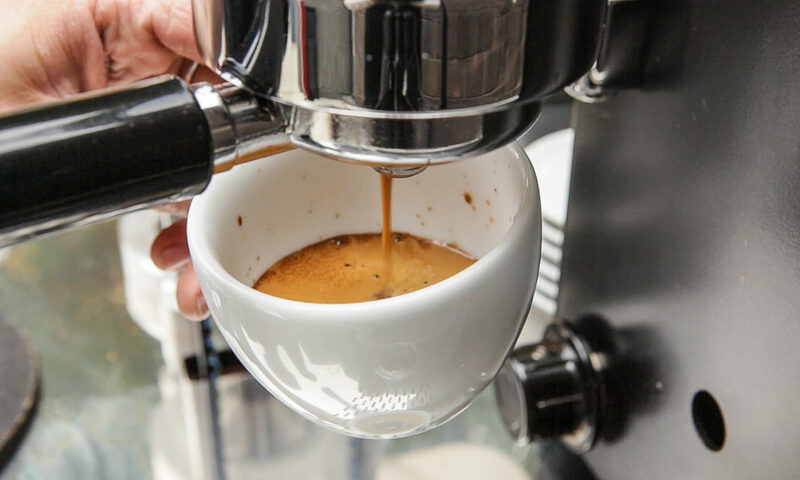 Bleed the steam wand of any moisture before inserting it into the milk. Now insert the tip of the steam nozzle into the milk. Open the steam valve completely to start the steaming action. Tilt and lower the pitcher until the tip of the steam wand is barely under the surface of the milk. There will be a whirlpool effect, but without big bubbles, and a smooth hissing sound is heard. If the nozzle is too deep, there will be a dull rumple, and you will only be heating the milk, not creating foam. Let the foam build. Keeping the tip of the nozzle just barely under the surface until this foaming action has expanded the quantity of milk that you started with to fill the pitcher to about 3/4 full. Now drop the tip of the steam nozzle down into the center to finish heating the milk. Let the pitcher of steamed/foamed milk set while you make your shots of espresso. This will give the foam time to settle. Combine ingredient then freeze into ice cubes. In a blender crush ( 7) of these Latte ice cubes with 2/3 cup cold milk. Blend until smooth. Pour into serving glass and top with whipped cream and garnish with a cinnamon stick. Fill remainder of glass with club soda (Blend). Top with whipped cream. Cremosa: Blend in 1 oz. of Half and Half. Blend. Top with whipped cream, and garnish with nutmeg-brown sugar granules. Blend. Top with whipped cream. Blend well. Add enough cold milk to fill glass about 2/3 full. Fill remainder of glass with ice.